I’ve been obsessing over barrettes lately. I love how they can make a plain old hair-do look mad fancy with minimal effort. Today over on Beauty Bets, I shared a handful of wallet-friendly barrettes I adore. And here are some of my vintage faves. 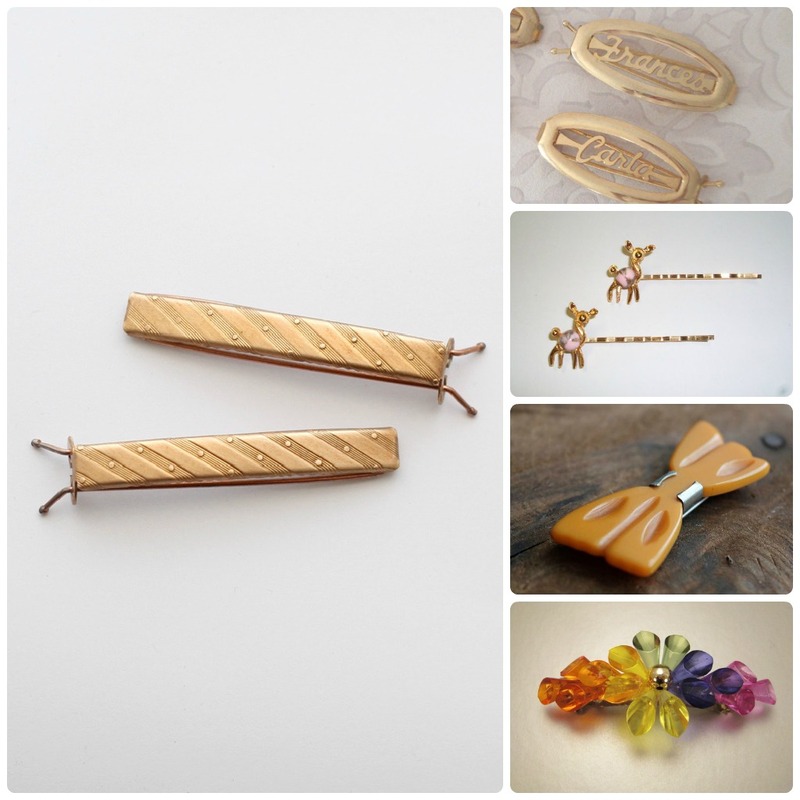 Kicking it off, going clockwise from the left-hand side, we have a pair of gorgeous gold barrettes ($8 for both) from the 1960s or 1970s available at Shop Lawrence. To the right, check out the sweet petite name barrettes ($4 a piece) from the ’60s. (I think I need the Betty one, btw.) Beneath that, an adorable set of little deer pins ($8). They’d look super fun tucking in strays with a tousled high bun. This orange 1930s Bakelite bow ($62) couldn’t be in better shape, from the looks of it. And last but not least, this super dazzly mod bauble ($14). I’d wear this on date night with a big old teased half-up half-down ‘do, big gold hoops and a LBD. And that, my dears, is it for today. I’m beat from the week and it’s only Wednesday. I’m excited for tomorrow though. I took a new route home tonight (way faster!) and spotted a thrift store to check out tomorrow. I hope your week is going swimmingly so far! This entry was posted in Uncategorized and tagged +, Beauty Bets, beauty thrifter, gettin pretty, vintage barrettes by highplainsthrifter. Bookmark the permalink. I love those hairstyles and the vintage barrettes, basically anything vintage!